I have had to face up to some facts this week. My shoulder has got so bad that I am unable to lift my arm much, and painting large canvases is not helping, in fact causing much of the discomfort. So I am going to do what the physio suggests and lay off painting large. I may get back to it, I don’t know, we will see. So this week I have been doing small watercolours and journal pages. With small scale I can rest my arm on the desk, so all’s good. I got brave yesterday and decided to redo my picture of Caro on A3 card with a layer gesso. It worked! No pain as I was able to do it flat on the table, got a bit covered in paint, but loved that. I used acrylics, gouache and watercolours. I added the text in Photoshop as the top corner looked empty, will think about it before adding it to original. I was on a roll, and decided to do a portrait of my sister’s granddaughter Kendal for her birthday. It was about A4 size on rough watercolour paper. I did the background first and then drew Kendal and then painted over the drawing with gesso, and then used watercolour to paint her in, the pencil lines of the drawing showed through a little bit, so I found it helpful when it came to painting her. I know it is not proper water colour techniques, but what the heck, it works! I am not sure that it is finished yet, so will brood on it for a couple of days before posting it to my sister. As I am talking about family the other thing I am working on is an art piece for my brother’s wedding anniversary latter this year. It is digital and I have used photos that he has sent me since he has come back into the family fold. Although I did use an image from freubels-freebies, you can see it in the background slightly. The lady on the bike is a reference to the fact that Dave and Liz were bikies and spent their honey moon on Harleys touring Aussie. This is extra special to me as Liz had breast cancer and it has just returned, so sad. I want to add text but need to find a quote that suits. So overall a successful week, a new beginning doing smaller works, sometimes we have to let go. Just a reminder to anyone who journals about their faith, I have a new weekly linkup - Journal inFaith - on my Stand on Faith blog. You are welcome to take part. These are all wonderful Sharon, but my absolute favorite is the portrait of your grandniece. She's adorable. Blessings! So sorry about your arm...I've had that happen....I take one ibprophen a day to take the inflammation down...it seems to help. Sometimes it takes a few weeks! Your sisters granddaughter is adorable...I'm sure she'll be thrilled with it!! All the watercolors are wonderful. Love your use of color!! Lots of great work here!! So sorry to hear about your arm. All of your work is wonderful but I love the one of your sister's granddaughter. She is beautiful. I am sure they will be thrilled with the painting. Wonderful work. It's good that you can still paint small, when your arm's had a rest you might be able to work on a bigger painting again for a short while. Maybe if you lay it down on the table, or let it rest in your lap? Sorry to hear about your sister-in-law. You did a great job on the photos! Wonderful work, I love all the layers and Kendal is so sweet. How your arm gets better so you can finish your big canvas. Wow, your artwork is beautiful, so sorry to read about your arm. Get well soon. 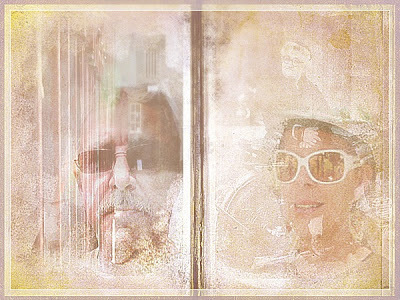 I like the photo-collage with the portraits of your brother and sister in law! I wish her all the best, it is a struggle! 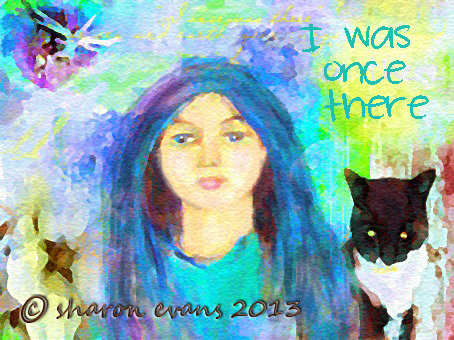 Oh wow -- AMAZING pieces Sharon! How wonderful!! Thank you for you visit and you wonderful comment! Very beautiful gifts! So special to make something for them. Lovely! Your granddaughters picture is wonderful! You can join the watercolour Wednesday! The link is on my blog! I'm sorry to hear you have to stop painting large canvasses because of your shoulder. I hope it will get better so you can paint large again soon. Mind you, your work on this blog post is beautiful so large canvasses loss is small watercolour's gain! I especially love your painting of your sister's grand daughter. It loooks beautiful - the background is gorgeous! Sorry about your shoulder. Hope you can get some help for it. Despite the pain, you did great work on these pieces. Love that portrait of Kendal. Great work. Happy PPF! Wowness..Kendall is gorgeous so wonderfully done..totally beautiful! I use gesso and watercolor all the time too..well said..it just works! Wonderful tribute to your loved ones..and so sad her illness has returned..keep hope and love and light shining in your heart! And hope your arm feels better too, many hugs to you. I have endured many problems with hands/ nerves and I know how challenging things can be..keep faith..there were times when actually doing art has shifted, healed and strengthened me..there was a time when I couldn't hold a cup or a toothbrush..so keep shining and take care of that arm and do whatever you need to feel better! Thanks for sharing such a beautiful and touching post full of treasures and art! beautiful work Sharon! They are all lovely, but I do adore the watercolor with your sister's granddaughter...so cute! happy PPF...hope your arm gets much better soon! sorry your pain is keeping you from the big canvases and hopefully it's only temporary. But you're doing marvelous works of art on the smaller substrates! Ugk! I couldn't imagine being in pain when trying to create! It sounds really unpleasant! But I am glad that you can at least work on a smaller scale! At least you can still be creative. 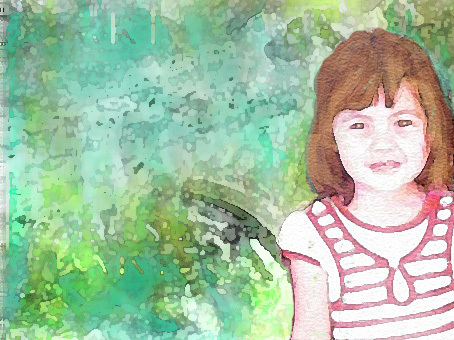 I love the painting of the little girl! So wonderful, dear Sharon! I love your paintings! Happy PPF and have a nice Weekend! Smaller works take less paint, too :) These are lovely, each with a distinct look and style. I'm glad you're not using only "proper" techniques. Good luck with your shoulder. For bursitis and inflammation, I slowly raise my arm as high as possible ten times in the morning under the stream of a hot shower. Glad to see you can express yourself so well in different sizes. Beautiful watercolour portrait, Sharon. Well done. I agree so much that sometimes we just have to let it go even if it seems to be not easy. love and blessings to you. get well soon sharon. a bit of exercise will help your shoulder heal better. You are great example of nothing can stop you from creating :) Look at your works.. all so wonderful and creative. It doesn't matter what ways or techniques because what's important is the process and how you are able to use those tools to the fullest. Get well! I think it's fun to change scale! Love what you did with Kendall's picture. That background is quite amazing! I enjoy your art but please take care of your shoulder first. A very wonderful tribute to your brother and sister-in-law's anniversary. I wish her strength and victory over this terrible disease. And take care of that shoulder, give it some rest from time to time.